The Sparta Workouts in the challenge will help build lean muscle while you burn fat and gain strength. The Sparta workouts are Metabolic Circuits of 10 exercises performed for 60 second intervals of work followed by 15 seconds rest or transition period. The workouts target the entire body and help to get you in the best shape of your life. During each interval you will perform as many reps as you can, with perfect form, then move on to the next exercise in the circuit. You will have 15 seconds to transition between stations, and then move onto the next exercise. After you finish the 10 exercises rest for 2 minutes. Then repeat 1 to 2 more times. This is called a 60-15 Interval workout (60 seconds of work followed by 15 seconds of rest). Total workout takes 41 minutes. Get your workout E-Book and start the challenge today. Fill out information at the top right of the website. This whole Spartacus regimen has been outstanding! The exercises never let your muscles adjust. Right at the point where you think you're getting used to them, Funk's pushes out a new set of exercises and you're back at square 1. Well, it's not at all square 1, as each week I felt fitter. Fitter in everything. Strength, speed, stamina. I've had more energy throughout the Spartacus workouts and this flood of energy has overflowed into all other aspects of my life. I'm more alert through the day and not once did I feel like I could crash when coming in after work. Then there's my class. I teach a beginners Students Union MMA class here in the UK, with many varying levels of skill and fitness. Every week I obviously have to spend my time teaching the session and not getting much training in myself. I still join in with sparring, submission rolling and pad work (both holding and striking), but oft times this is not enough. It only took one week of Spartacus to notice the difference between where I was the week before. Then each week the differences continued to be apparent. Training and sparring partners have noticed this change too. My power is through the roof, coupled with my increased stamina I'm able to strike at my peak capability for many more rounds than I ever could. My submission rolling has also seen a vast improvement from my explosiveness between positions to having greater cardio than my opponents. Every aspect of my game has improved - I would say even my technical skill has improved as I feel less gassed, remain calm and focus on the submission at hand rather than gulping for air! Usually when reading these sorts of things, this is the part where the 'reviewer', of sorts, would say "but..." and start to drift onto some negatives. Seriously. I looked at the diet and thought two things: "How much do you want me to eat!?" and "Aww crap, where's the beer?". After a week you adjust to the sheer volume of food you need to consume, and you'll find yourself noticing the hunger-pangs right around the time your morning/afternoon snacks are due. Kick forward a few more weeks and the whole diet regime becomes second nature. I adjusted to using less (or none at all!) oil. Food that you'd instinctively put salt in no longer needs it. Other foods, that prior to the workout, I'd avoid or didn't like the taste of, quickly become typical veggies to add to your meal (Broccoli, especially), and then there are the foods that you may never have had before - sweet potatoes, man I can't get enough of them! Hopefully you've seen my before and after pics, and the table of changes that my body went through. I'd hope these would be enough to get you to join the Spartacus routine and to trust Funk. He worked with us throughout the whole of the routine, providing new workouts, answering questions and always on hand to provide motivation... but honestly, this last part you wont need. Once you start seeing the results (which will take just a few short days!) you'll have all the motivation you'll ever need. Good luck, keep on training, and as Funk would say "Get. It. Done!" 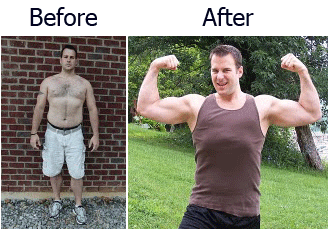 Jason lost 15 lbs pounds in 4 weeks and gained muscle and strength. Jason joins a long list of people who have lost weight, ripped up, become more muscular or changed their body completely using the free. Finished the first week and I feel awesome! 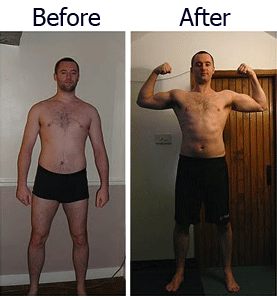 More energy, sleeping better, muscles and joints hurt much less (even after the sessions!). My cardio's already vastly improved, recovery rate is through the roof... feel stronger, faster and generally more alert. As of right now, this Spartacus thing is THE best training system I've ever done! Sure, as with all training systems, you have to dedicate yourself 100% with the exercises, nutrition, rest periods - and I always try and do so, but with Spartacus I just feel like I'm developing even faster! I have received a lot of great success stories of people losing weight using my 4 Week Spartacus Workout Challenge, but Awat was one of the first people to tell me about how he gained some weight and became more muscular incorporating the Spartacus Workout , supplements and good nutrition. He called me about 6 weeks from the wedding and said, "Funk, Kim and I want to be in the best shape of our lives for our wedding, can you please give us a workout and nutrition plan." But Awat mentioned to me that he wanted to gain more muscle and still be ripped, and Kim wanted to lose some weight and look toned. I wanted to make sure that supplementation was a big part of Awat's plan, because with the stress of planning the wedding and putting the body through these intense workouts, the supplements that I suggested were to help build strength, add muscle, recuperate and detoxify. Enter the 4 Week Spartacus Workout Challenge. I told him to use the challenge and stay close to the supplements and nutrition plan. The one supplement that made an incredible difference in adding size and strength for Awat was Silver Bullet (Kre-Alkalyn). Awat told me that from day one when he started taking Silver Bullet, he could feel and notice a difference, In fact he even mentioned that the Spartacus workouts seemed to be getting easier for him, even though they were getting more challenging. Awat looked incredible, the best I have seen him in 20 years. Absolutely ripped and the muscular. He told me he did the Spartacus Workout Challenge, added some of his own exercises, took the supplements I suggested, and stuck to a clean nutrition plan. Kim looked amazing as well. Just check out the pics. Three years ago, I was an avid horse-rider, rugby player and dancer until a serious knee injury put the brakes on all my active hobbies. For two years I was in and out of hospital as my fitness levels went down and my weight went up. When my knee was repaired, I started on the long road back to fitness, finding a new love for Muay Thai boxing and MMA. Unfortunately, no matter what I seemed to do, I couldn't lose weight. I tried all the latest diets from slim-fast through to slimming world, I would lose a few pounds in the first week and then nothing. Many of you may be thinking "Oh well, she must have cheated" but I never did, I was too determined to get back into those favourite jeans! After learning some of my immediate family were suffering from Hypothyroidism I went straight to the Doctor. Thankfully, I was given the all clear but this still didn't explain my inability to lose weight. Eventually, after a barrage of tests, the Doctor said "Maybe you just can't lose weight". I was excited to learn about the Spartacus Workout but in all honesty I was a little sceptical, after all, everything else I had tried had failed. After the first week I started to notice my clothes were looser and by week two the weight was still melting away! I was shocked and overjoyed! Every week the workouts changed and the intensity grew and, whilst they all brought new challenges (and new ways for me to colourfully curse Funk :-P), my cardio levels continued to rise, my strength increased massively and the jeans I had so sorely missed now fit. I have recommended the Spartacus workout to so many of my friends and family and even though it wasn't easy, I had a lot of fun and the results speak for themselves. Estella Hom, is a Kettlebell Fat Loss Expert, athlete and a graphic designer. She is also a trainer at the Funk Roberts Fitness Boot Camp. Design and fitness are her two passions. After 4 years of crunching designs in front of a computer, all nighters, and very poor eating habits, she earned her Bachelor of Design Degree from York University/Sheridan College and was fat. All of which changed when she began working out, training with kettlebells and embracing a healthier lifestyle. The fat literally melted off her body and she underwent a complete transformation. She lost 45lbs, 21â€³ off my body, am down 7 dress sizes, and feel better than ever! She still designs away on her computer but lives a much more athletic and balanced lifestyle. Estella didn't always look like she does now and with Spartacus Workouts she continues to improve her already fit body. "ARE YOU IN OR IN THE WAY?"